Every year since 2010, AMP, the campus ministry at MBU, has provided a small groups ministry for the student body. “They add a nice sense of we do truly care about our Christian faith as a campus. That’s one of our core values that we’re serious and intentional about it. 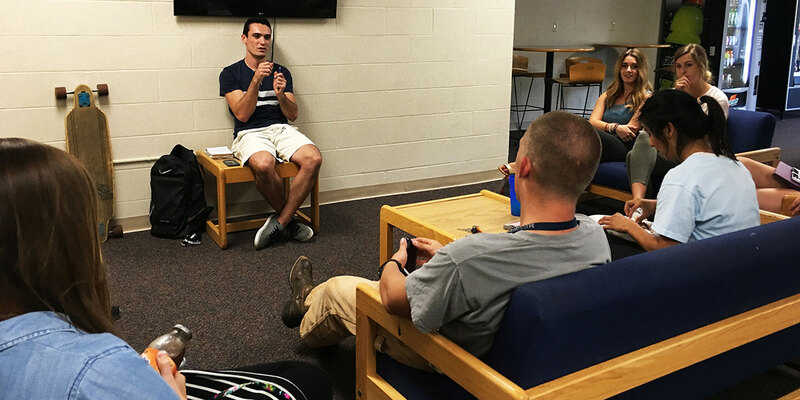 That’s one of those intentionality points that we do strive to tell people about Christ and to tell people about the gospel in these small groups,” said Ben Carril, MBU community leader. Groups are meeting in the lobby of the Spartan Village South complex, the apartments, North Hall and Pillsbury-Huff. Jonathan White, campus minister, said that in recent years AMP — which stands for A Mighty Passion — has been putting more focus on the small groups and has really started to invest time and personnel on the small groups. “The past four years have been a lot of development with it and investment,” White said. This year there are five different co-ed small groups on campus, using the residential buildings for their meetings. “I think it provides an avenue for people to have a safe space to lean on people or share with people something that might be going on in their life and also a place to learn,” said Melanie Laurence, MBU community leader. Laurence, in her second year as a community leader on campus, first became a leader to have the ability to influence the incoming and returning students’ surroundings. “I just wanted to be able to surround people with a strong sense of community and spiritual community like I got when I was a freshman,” Laurence said. The groups are led by students on campus, called community leaders. Each group has two community leaders who help lead the meetings. “I wanted to be a community leader because I love to build relationships with others and I wanted to be an influence to the young Christian girls on campus,” said Erin Roach, sophomore human services and psychology major. The small groups are connected to the overall theme of chapel and Thursday Night Live. The main focus of the small groups is to build greater community on campus while growing students’ walk with Christ. “I think the end result, the big picture view, is for the students that are in there are walking closer with the Lord as well as finding that community with each other to help each other walk closer with the Lord,” said White. Roach echoed the same desire for greater community on campus. “I hope that whenever we see each other on campus we’ll see and talk to each other about each other’s days and building relationships and inspiring them to be leaders,” said Roach. Leaders of the small groups also are desiring to see people step up as leaders on campus. “I’d really, for people who are believers in the small group, like to see leaders develop from there,” said Laurence. Small groups are not only about community growth but spiritual growth. “I hope that they can learn about discipling others and that they can see what they’re learning and apply that to their lives and that they can go and disciple people on campus,” said Carril.